Product Highlights This high-end model has been created using Kowa's most advanced optical technology. The 82mm objective lens provides outstanding light gathering power, ensuring a bright field of view. The sharp view and accurate color reproduction qualify the scope as a powerful instrument for observation at dawn or dusk. This sophisticated scope with high-end specifications is the dream instrument of every bird watcher, hunter, or target shooter. All lenses, prisms, and even dust protection glass on the main body are built with multi-layered coatings, ensuring clear visual range and sharp images. Strong yet lightweight, polycarbonate materials, including carbon fiber, are used in the body, providing a rigid structure that can endure hard usage. The shape is designed for ease of handling and ergonomic fit in the hand. The housing is waterproof to JIS Protection Class 7 and filled with dry nitrogen gas to prevent the lens from fogging. "Not intended for underwater use". 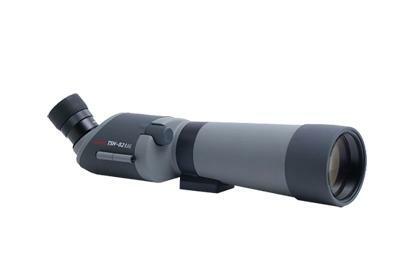 Click the button below to add the Kowa TSN-82SV High Performance Spotting Scope (Angled) to your wish list.